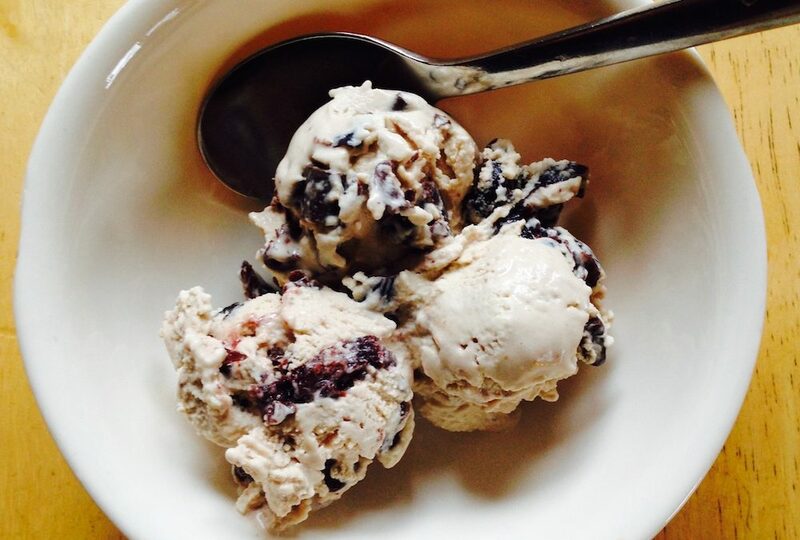 I never thought a dairy free, egg free ice cream could taste this good, but it did. 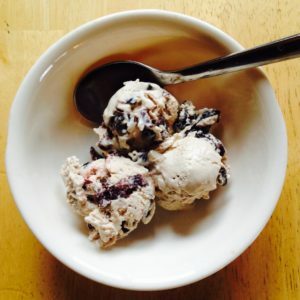 Dairy free, egg free, coconut-based ice cream with cherry and chocolate chunks that actually comes pretty darn close to the real article. 24 hours prior to making the ice cream, put the ice cream bowl in the freezer. It should be thoroughly frozen through and not make any sloshing sounds if you shake it. Reserve 1/2 cup of the coconut milk. Warm up the remaining coconut milk, coconut sugar and salt over medium heat in a saucepan. Whisk the arrowroot starch into the 1/2 cup of coconut milk until dissolved, and add back into the saucepan. Whisk to mix in the arrowroot starch, and cook until thickened, 6-8 minutes (but don’t let it simmer), stirring constantly. Take the saucepan off the heat and allow the mixture to chill in the fridge for four hours or overnight so it thickens up further. (The recipe suggested putting plastic wrap over the top of the mixture so it doesn’t form a skin, but I didn’t bother.) It will be kind of a custard-ey consistency. Take the ice cream bowl out of the freezer and dump in the mixture. Turn on the ice cream maker and allow it to freeze up for 15-20 minutes, or until thickened up. I did find that the best consistency was right after freezing in the ice cream maker. It still hardens considerably in the freezer, so if you have leftovers or you are just saving the batch for later, allow the ice cream to sit out for a little bit so it can soften somewhat. Also, transfer the leftovers to another container before freezing; if you leave it in the freezer bowl, it will be next to impossible to get it out. Trust me. Did you use the shelf-stable carton of coconut milk? or was it from the refrigerated section of the grocery store? Thanks. I used a carton, but it was the same stuff as comes in the cans (just a bigger container); I would say use the cans rather than the carton “milks” you buy at the store because the cans are way creamier. THanks very much for your reply… I don’t have cartons available where I live that are equivalent to the canned… so will use the canned… looks delicious. Yep, canned will be best then! Good luck!